Loads of amazingly easy photo editing options. Fun themes with new backgrounds, fonts, and more added each season. New for 2017! Professionally designed templates. Save your designs to edit later, on your phone or computer. Chrome extension for grabbing images and screenshots. You can upload your own fonts in addition to using theirs. 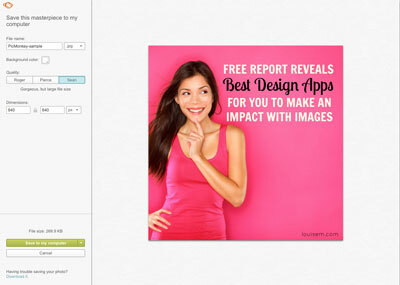 If those features sound useful, check out the PicMonkey tutorial below! Not sure? No time to read now? Download your FREE comparison chart! Ready to try PicMonkey? Head on over to PicMonkey.com. You don’t even need to set up an account, however I recommend the free trial so you can access all the features. Hover the Design icon (*t) and decide whether to start with a template, blank canvas, or custom size. The first two will bring up dozens of options, which you can sort by category, size, and tags, to find what you want. I started with an Instagram square. If you want to add a background, click on the crosshatch icon in the far left column. 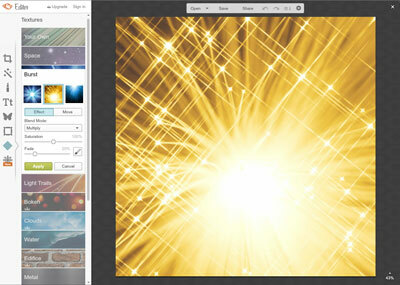 PicMonkey had loads of free backgrounds to choose from. You can adjust the saturation of the color, and the transparency, by playing with the sliders. You can even layer multiple backgrounds to create a completely unique effect. Or, upload your own image from your computer, Facebook, Flickr, etc. You can even add effects to your background! These are found via the magic wand icon. Be sure to click Apply if you want to add the effect. We’re going to keep it simple, and go right to Text – the Tt icon. Click Add Text at the top. Now choose a font, click in the text box, and start typing. Lots of formatting options appear in the pop-up menu. Add as many text boxes as you need to say what you need to! Don’t forget to include one for your name or URL at the bottom. One example of the overlays (or stickers) is shown at right. Fun, right? But we’re ready to save, so click the button at the top of your screen. Save will save an editable copy to your Hub. Export will save a flattened (non-editable) image to your computer, OneDrive, or Dropbox. In PicMonkey, you can change the resolution you want to save after you’ve made your image– or stick with what you set up originally. You can choose from 3 file sizes of JPG, or a PNG. I always choose PNG, as it’s the best quality – especially for Facebook, which loves to compress your JPG images. If you’re going to use the image on your website, also save a JPG, which will load faster. NOTE: After exporting, PicMonkey will take you back to your graphic. Don’t close this window! If you want to make additional graphics with this layout and different text, do so now. Or, save your creation to your Hub to edit later. You can access it on all the devices where you use PicMonkey – phones and computers! Pick your fave color to Pin! Orange, Yellow, Blue here, or Purple below. What do you think? Will you take the Monkey for a spin? 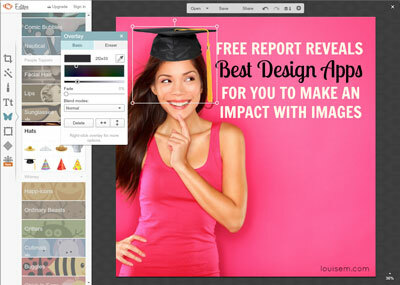 You can try PicMonkey Premium FREE for 7 days. Upgrade for the affordable cost of $7.99 paid monthly, or save by paying only $47.88 for the whole year. That’s 50% off! 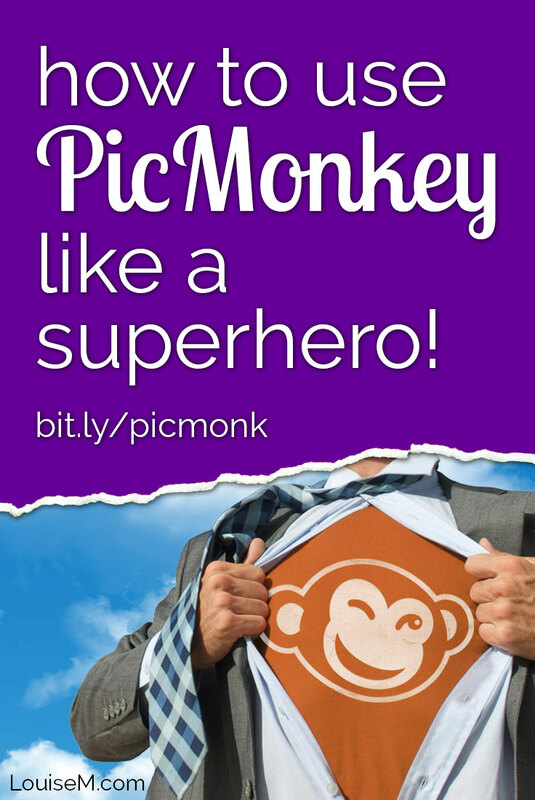 As of September 2017, PicMonkey no longer has a free-forever version. 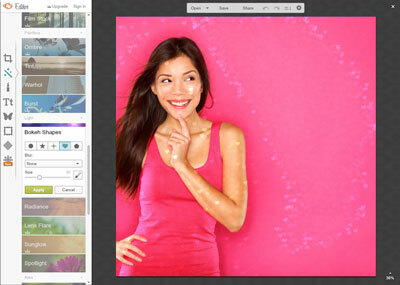 If you’ve tried PicMonkey or another design tool, I’d love to hear your opinion in a comment below. 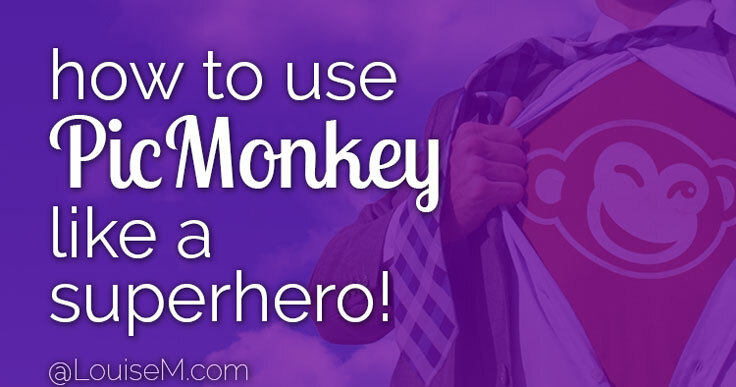 Did this post help you learn how to use PicMonkey? Pin it! Oh The Places I’ll Go! Thank you for sharing your free download and this post. I will be signing up for “The Monk” now thanks to you. I have a blog, plan on starting a YouTube vlog soon, and recently started edit video for other’s professional use. I want to utilize Instagram and Facebook to grow my platform and readership. I have a lot to learn, so I am excited you have given me so many resources! I’ll be sure to follow up after I have used PicMonkey. Thanks for the help! Sounds great, Bryanda! Love your enthusiasm. Enjoy. subterranean insect to use Instagram and Facebook to develop my stage and readership. I have a long way to go, so I am energized you have given me such a variety of assets! I’ll make certain to catch up after I have utilized Pic Monkey. Much obliged for the assistance! I’ve used the free version of PicMonkey for a while now. Today I went in to edit then export a photo and whenever I click on the ‘export” button the program will only let me “try it for free.” I can’t export my edited photo. Is this a new thing? That PicMonkey is no longer free in the basic version? Yes, it’s new this month. You get a 7-day free trial, after that PicMonkey is 47.88 for a year or 7.99 monthly.